Dan and I arrived in Macedonia on Jan 12 with the belief that if we left the country every 90 days, we could maintain our legal status in Macedonia. Last week we learned we were wrong because about three years ago, Macedonia changed their laws to comply with EU requirements. Now visitors can remain in Macedonia without a visa for only 90 days of 180 days. Subtracting my time outside of Macedonia, yesterday I became an illegal alien. Dan becomes an illegal alien next week. 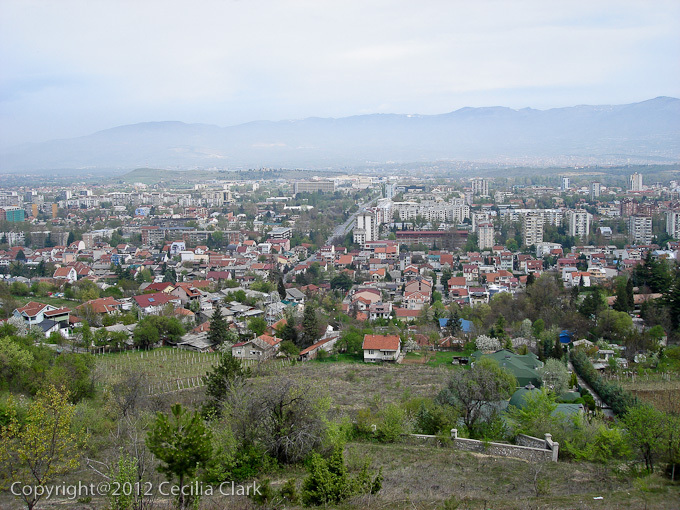 Dan's Macedonian lawyer has advised us that since he is in the process of securing a work visa that we should be okay. But, that is only his word. We are worried that when we go to Cairo, Egypt, at the end of the month, we will either be thrown out of Macedonia or not be allowed to re-enter Macedonia as we have over stayed our non-visa status. We've had varying stories about what happens when you overstay. Some people have received reprimands at the border but been allowed to enter while others have been refused entry. At least now we can have a Plan B in place for Kali Cat should we not be allowed to return to Macedonia. Today, Monday, was a holiday for Easter Sunday. Dan didn't have to work so he joined the Monday hike. We hiked about two hours across and up to middle Vodno making a loop to return to the start. The weather was beautiful while we were hiking. 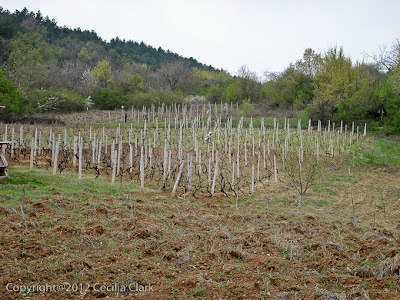 The slope of the mountain is covered with small gardens, orchards, and vineyards. Despite the weather, yellow forsythia and wild plum and apple trees covered with white blossoms said it was truly Spring. We felt the first sprinkles as we returned to our apartment. The rest of the day was mostly gray with intermittent rain.